While no one can accurately predict exactly what's going to happen in the transportation industry over the next fifty or more years, current trends indicate that we're going to need some sort of fuel for our cars for at least that long. So it makes sense to consider opening a gas station as a viable business investment. But there are more factors to consider than the obvious demand for such a business. These include the fairly high startup costs, the relatively low profit margin common to the industry, and the effects of a fickle economy on an otherwise healthy gas retail business. While specific dollar and cent figures range dramatically across the country based on prevailing real estate, insurance, tax, and labor costs, even the most business-friendly environments are going to require a significant initial investment from a business owner opening a gas station. • Land – Since the most profitable gas stations will be in heavily trafficked areas, preferably near main highways or urban thoroughfares, optimal land is likely to be available at a premium price. • Building – For gas stations with little or no other products or services available, building costs will be limited to a modest building for housing the cash register and an employee to man it, along with adequate lighting and shelter to cover the pumps. Any additional products and services (which are becoming increasingly necessary, as noted below) will require additional building costs, including convenience store space, one or more car wash bays, service station bays and equipment, etc. • Fuel pump installation – Assuming the gas station is being built from scratch, adequate tanks for the fuel the station intends to sell will need to be installed underground and pumps installed above, with adequate room for safe traffic flow around the pump islands. If an existing gas station is being purchased, this cost will be much lower, but an investment will likely still be required for inspection of and possible repair to aged pump and tank systems. • Permits and insurance – All of the above will come with required and recommended licensing, permits, and insurance costs based on local laws and regulations. Particularly, environmental laws play a major role in the delivery and storage of fuels, and the distribution of highly flammable liquid in a high-traffic environment leads to fairly high liability insurance cost due to the potential for disastrous accidents. • Labor and operating costs – While not a large expense in comparison to the others noted, the potential gas station owner should expect to cover labor and other standard operating costs for several months before adequate profit can be expected to cover them. The average independent gas station operating in the United States earns approximately 2-3 cents from every dollar of gas they sell. That's a very slim profit margin, especially in comparison with other industries where the average profit margin hovers between 7 and 8%. Therefore, retailers strictly selling fuel rely on a very high volume of sales to meet and exceed operating costs, and fluctuations in the price of gasoline or the driving habits of the market can have an immediate effect on so slim a margin. To counteract this effect, many gas stations have added additional products and services to their fuel business, including such options as automatic car washes, attached garages with simple repair and inspection services available, and – most popularly – convenience stores. The driving public has responded very well to the convenience store/gas station combination, as evidenced by the fact that “approximately 80% of all the fuel purchased in the country” last year was sold by combination locations that allowed the busy traveler to purchase coffee, a snack, or other convenience items while fueling up, according to the Association for Convenience and Fuel Retailing. This trend will continue. So if you are intent on opening strictly a gas station without additional amenities, you will need to develop a business plan that can sustain lower volume sales within a very thin margin over time. While every business can and will feel the effects of economic slowdowns and major cultural events, few industries feel that effect as immediately and dramatically as retail providers of fuel do. While gas stations have little if any control over the cost of a gallon of gas (as demonstrated by the profit margin information above), that same per gallon cost is seen by the buying public as an indicator of overall economic stability. The price of gas has a ripple effect on many other staples such as food, utilities, and consumer goods. Therefore, when gas prices rise even slightly, consumers can and will limit their driving, conserve their fuel consumption, and otherwise “batten down the hatches”, all of which can eliminate the volume of sales a gas station relies on to turn a profit. Similarly, when prices drop, stations can experience and unexpected increase in volume, even to the point of diminishing their supply of fuel. Since the cost of oil fluctuates based on cultural, political, economic, and even diplomatic causes, few if any experts can accurately predict when and how these fluctuations will occur. But tanks must be filled at the going wholesale rate when supplies run low, regardless of whether the going rate is good or bad for the gas station owner. 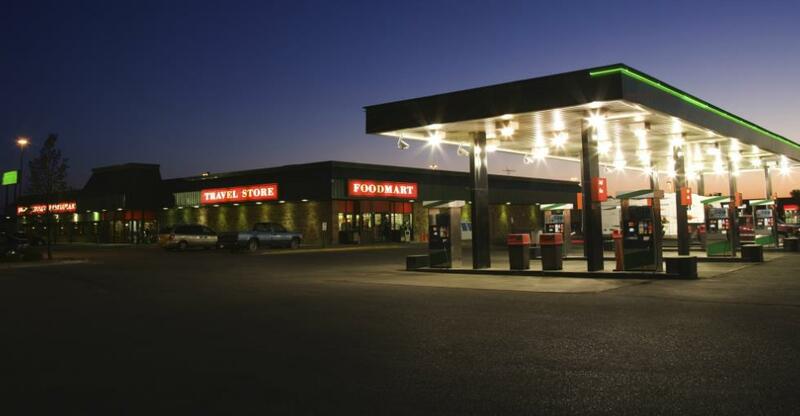 Opening a gas station can be a profitable and rewarding enterprise under optimal conditions. However, the potential entrepreneur must understand the business environment can be as volatile as the fuel he sells, and must plan and run the business accordingly to succeed.